"This photograph was taken at Springfield Road Primary, approx 1957/58. Does anybody recognise anyone,"
Please contact webmaister if you can put a name to a face or hiv a tale tae tell. 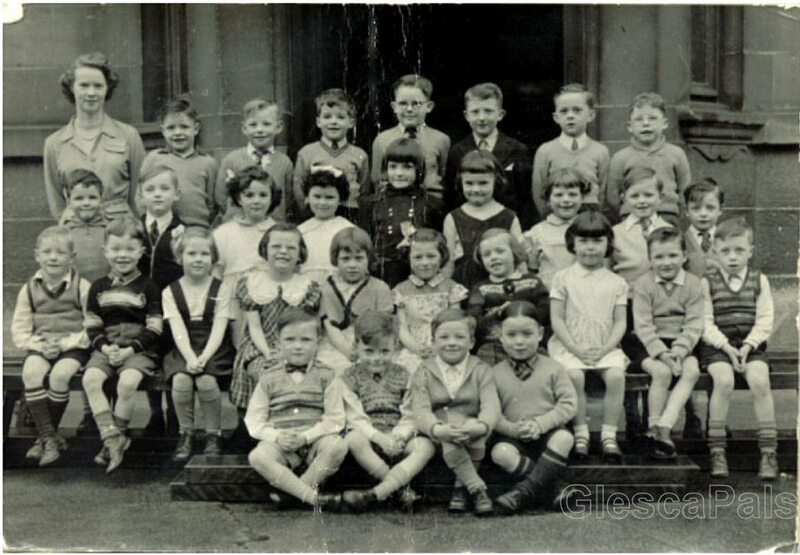 "Hi, Springfield Rd School photo 1958 my brother Thomas Boyle is the one in the 2nd row #1." Hi, we went to Cuba on holiday and met a couple from Bridgeton who now stay in Canada. They told me about this web site, which I must say is fab. Went to Springfield Road school and went into photo for 1958. I am in the second row No8, third from the end. My name is Muriel Boyd. Can you please add this to the photo. Dear webmaister, just came across my old school photo from springfield road primary school 1958 and all the old memories came flooding back, (was it really that long ago). I think I can supply a few of the missing names in the photo, top row teacher miss yuill, no5 robert adams 3rd row no3 carol palmer no7 margaret mcgeachy no9 jim sproul 2nd row no3 margaret crann no7 moira rooney no10 robert skinner, I hope this information is of use to you, keep up the great work it"s much appreciated, yours, jim morrison. Found a photo of my brother taken in 1958 when he was 7 yrs old. He's on the far right (number 10 I think that position is) of the second row. You Have Robert Skinner but the proper name is John Skinner. He will be 60 this year.